The fall in sales volumes considerably affected brewers’ revenues. The two digit growth rates that were observed till 2013, gave way to a more modest figures and in 2015, the sales revenues grew by ...% compared to 2014 to ... bln yuan. In dollars the decline amounted to ...% to $... bln due to yuan devaluation. 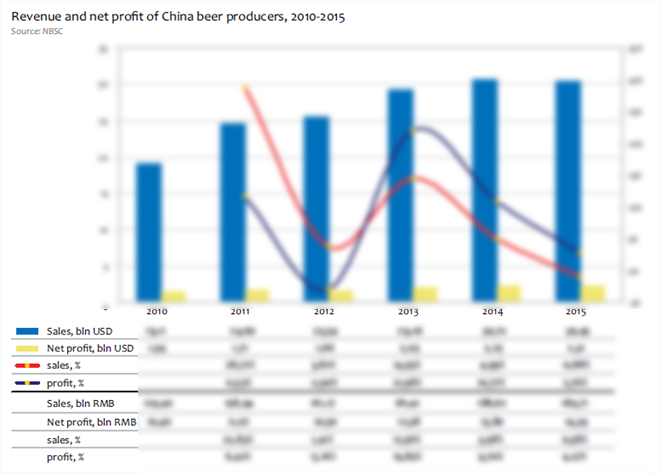 It is no doubt that in 2015, the brewing industry also demonstrated one of the lowest positive growth rates of total profit over the last 6 years which is ...%, to ... bln yuan (or a ...% growth to $... bn). Though this figure can not be called a negative dynamics but it looks pale against the 11% growth in 2014. 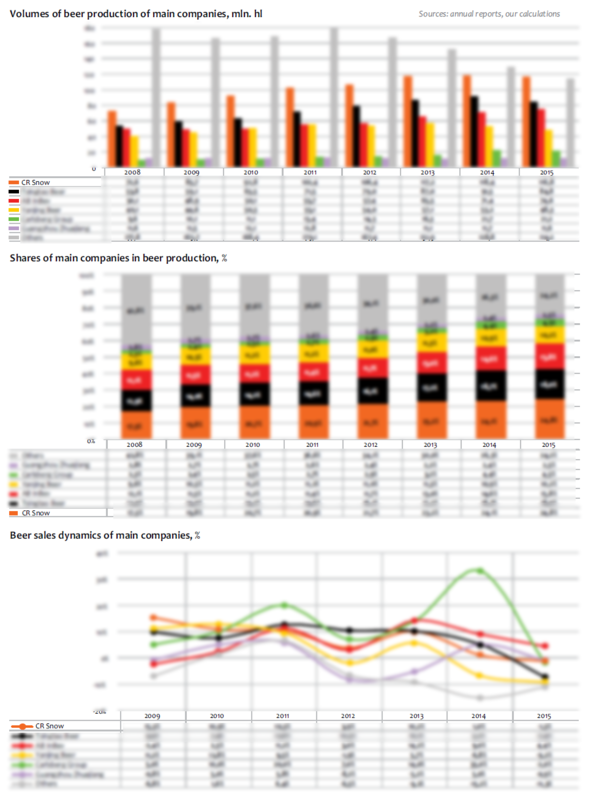 However, the output volumes decrease made the brewing companies give a closer look to their performance. It is noteworthy that until 2013 the growth rate of sales revenue took the lead over the growth rate of total profit, and then the situation had changed. Despite a general downturn trend reduction of the rates of income change, the dynamics of total profit exceeds the dynamics of sales revenue. The better financial performance was attained by shutting down ineffective businesses, lower prices for raw materials and the market premiumization. The main role was played by the premiumization. According to AB InBev, the gross profit of premium brands is over ... times that of core and value, and for superpremium this ratio is over .... 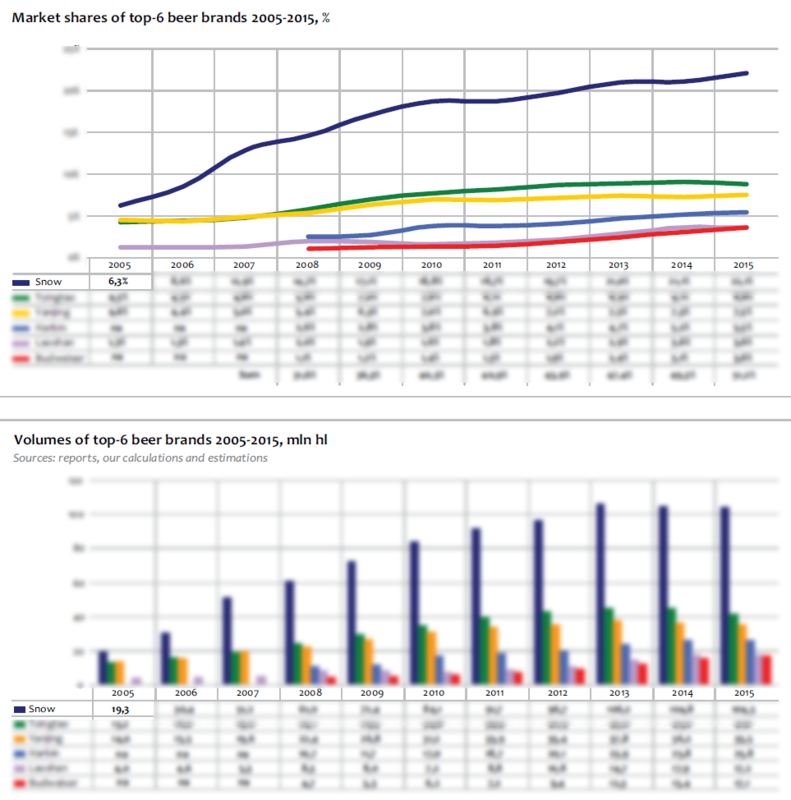 The positive price mix in brewers’ sales reflects the growth dynamics of the expensive beer and the continuing market growth by value despite the volumes decline (see the previous chapters). The beginning of noughties was a period of romantic relationships between transnational companies and Chinese beer producers. All the country round, joint ventures with different proportion of western and Chinese participation sprang up. Often entrance to the market took place by buying a share in state companies in the course of privatization. An independent work of foreigners was at the beginning limited due to lack of experience on the market, administrative isolation of the regions as well as the local bureaucracy and protectionism, which complicated any decision. However by the beginning of 2016, there remained not so much joint projects, and the Chinese brewing industry is still by ... belongs to the national private and state enterprises (taking into account SABMiller’s exit). Two major international companies having a considerable market weight in China today are AB InBev and Carlsberg. Their development was neither easy nor even because of the transition from partnership strategy to independent work and arising financial problems. The difficulties of entrance and further expansion are connected to the necessity of considerable capital investment. 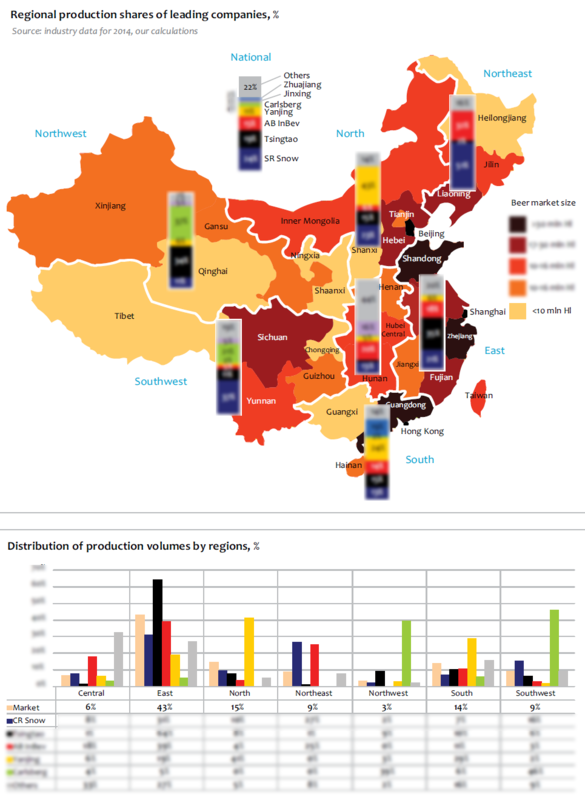 Owing to the vast sizes and fragmentation of the Chinese market, steady development requires a “critical” mass of productions located in distant provinces. That is why unlike most of the western markets, the leading companies in China are still very unevenly represented in the country. Though brands by any of the companies can be found throughout the country, the market share of brewers in many regions is much different from the national sum. For example, CR Snow is a leader on the Chinese market, and it operates a powerful network of productions, but in Sichuan, Liaoning, and Guizhou it is represented better than in other regions. 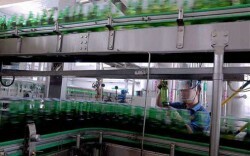 In Fujian province in the north of the country, more than a half of beer sales accrue to AB InBev. Province Shandong is obviously dominated by Tsingtao and Beijing Yanjing has strong positions on the capital market. A more detailed consideration of the brewers’ positions will be given in the chapters about companies. But obviously, each of the producers have a much bigger market share in the regions with large capacities and where the regional brands started their history. State involvement in regional breweries and close connections beer producers with local trade companies thorough joint state ownership are of crucial importance. 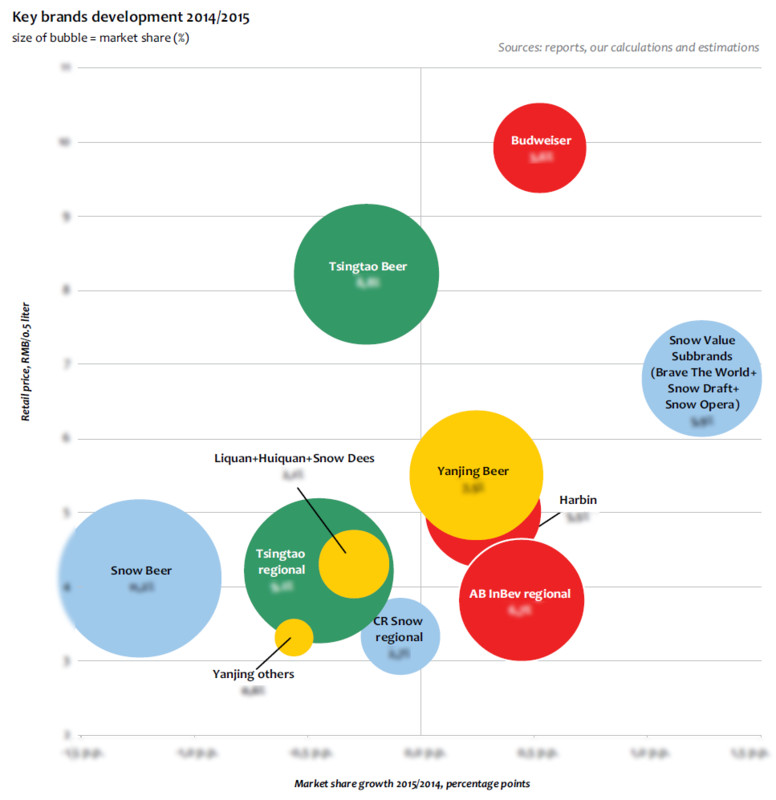 The excessive economy segment formed by many regional sorts also contributed to the beer market fragmentation. Because of the large distances, the logistics expenses transporting cheap beer far from the production site becomes nonremunerative or uncompetitive. As a rule the delivery radius does not exceed 300 km from the production site. The low price of beer means the regional brands and enterprises balanced at the zero margin edge making several cents on each bottle, and got unprofitable as the consumption volumes of cheap beer fell. Yet, each brewing company has a lot of potential growth directions due to geographic expansion of little developed markets. That is why we should not be surprised that amid negative beer market dynamics, there is still news concerning new breweries, modernizations and relocations. Obviously, such decisions were made at the time of the riot growth of the market, and due to the current economic uncertainty they will not be taken so easily. 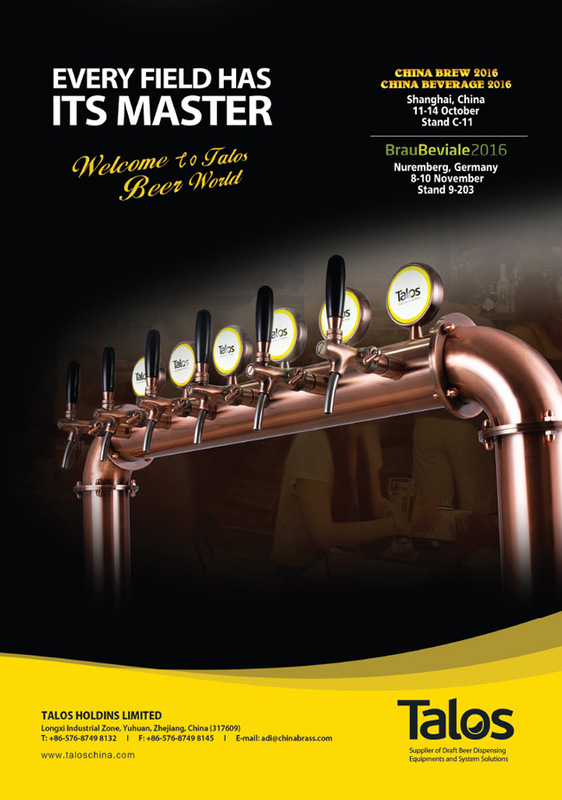 To get the full article "Analysis of beer market in China" in pdf (60 pages, 65 diagrams) propose you to buy it ($45) or visit the subscription page.